Welcome to our Council’s Training Page. We strongly believe that every youth deserves a trained leader. Simply put, a trained leader delivers top-notch guidance and program to the youth in our programs. There are many benefits to being a trained leader: increased knowledge of Scouting programs, program resources and practical experience, and an ever expanding network of fellow Scouters. In addition, it has been demonstrated that a trained leader retains 18% more youth in their units than an untrained leader. 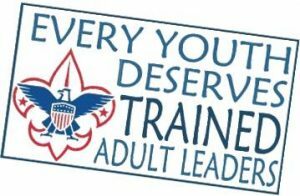 Regardless of your experience level, we have a training that will benefit both you and your Scouts. Every leader deserves a great Trainer. We strongly believe in building a robust Training team to ensure our leaders receive the best training possible. If you have an interest in experiencing the benefits of being a Trainer, please contact me at arulery@gmail.com. On the calendar below, you will find details on upcoming courses. Do not hesitate to reach out to anyone on the Training committee for assistance. Thank you for all you do for Scouting, and I look forward to seeing you at one of our upcoming events!